The Faculty Research and Scholarship Presentation Series, which is organized by Assistant Professor of English and WGS Elizabeth Neiman, kicks off its spring 2018 season with a lecture by Laura Cowan this Thursday at 4pm in the Writing Center. Professor Cowan will speak about “‘Fusions that Infuriate’: Rebecca West’s Subversive Use of Hybrid Genres.” Cowan’s book on the topic was published by Bloomsbury in March of 2017. Light refreshments are provided by the English Department through its Lloyd H. Elliott Fund. The Department of English’s faculty presentation series is intended to advance conversation and community among students and faculty. All are welcome. Before we adjourned for the winter break, the English Department recognized eleven English majors with scholarships generously endowed by Stephen and Tabitha King in memory of Stephen’s mother, Nellie Ruth Pillsbury King. The sophomore recipients were Rachel Castonguay, Anna Kulinski, and Katherine Skvorak; the junior recipients were Catherine Gottwalt, Maddy Jackson, and Christopher King; and the seniors were Sarah Allisot, Eric Arnold, Mary Manley, Amber Mondor, and Tyler O’Keefe. These students are, each in their own distinct way, ambassadors who reflect well the values of creativity, curiosity, compassion, and courage that animate our discipline. I am happy to report that a number of them have agreed to serve on a student advisory board that will convene several times this spring. Sarah Allisot is a senior who is majoring in English with a concentration in Creative Writing. Her two minors are in Computer Science and Women’s, Gender, and Sexuality Studies. Sarah began her literature journey at a young age and has used her lifelong interest to push herself to continue working in the field post-graduation. She aspires to one-day work in publication or editing while writing novels or short stories on the side. Her current studies have pushed her to work social issues into fiction pieces, and she feels that it is the best way to bring much-needed representation and humanity to hot-button issues. Eric Arnold is a senior English major with a concentration in Creative Writing. He aspires to have his writing be “capable of being relevant in the eyes of the reading public” and plans on working as a technical writer as well. He personally prefers writing works of fiction, and particularly enjoys exploring the changes he imagines occurring in the future due to technology and changes in human nature. With his writing, he hopes to explore the effects this may have on civilization. He abashedly admits the closest he has been to reading any works of Stephen or Tabitha King is having a copy of On Writing on his bookshelf. He does, however, work at the university library, and sees their works around him every day. Having grown up in the same region as Stephen King and attending his Alma Mater makes him feel, in many ways, connected. He was flattered and inspired by the scholarship award, and would like to note that he fully intends on reading Stephen and Tabitha King’s works. Anna Kulinski is a junior who enjoys reading creative works, particularly poetry and science fiction. Anna finds inspiration in Stephen and Tabitha’s public stance on current events, and tries to be an activist in areas that matter to her. Since her freshman year at the university, Anna has fallen in love with this campus, and subsequently hopes to use her English degree to become a professor here at the University of Maine. The Conference on College Composition and Communication has conferred the 2018 CCCC Technical and Scientific Communication Award in the category of Best Article on Pedagogy or Curriculum in Technical or Scientific Communication for “Measuring Quality, Evaluating Curricular Change: A 7-Year Assessment of Undergraduate Business Student Writing“ in Volume 31 Issue 2 of the Journal of Business and Technical Communication. The award will be presented to Dylan Dryer and his coauthors, Scott Warnock, Nicholas Rouse, Christopher Finnin, and Frank Linnehan, at the Awards Session of the 2018 CCCC Convention in Kansas City, Missouri. The session is scheduled for Friday, March 16, from 6:15 to 7:30 p.m. The English Department invites undergraduate students to request funds from the Everman/Major Travel Fund for travel to and from writing/rhetoric/composition-related professional conferences or workshops, readings, publishers, graduate programs in writing to which they have applied, or to other venues related to their work as writers, writing tutors, or future teachers of writing. Students should use the attached form to file their requests. Awards will be based on the merit and persuasiveness of the student’s plan and on the fund’s guidelines. Amounts will vary according to available income in the fund and the judgement of the selection committee. Students will be expected to file a brief, prompt report on their trip when they return, along with all receipts. Welch Everman was a writer of great and varied gifts, as well as an active and popular teacher in his years at the University of Maine. Katherine Major graduated UMaine with Highest Distinction and Highest Honors in Art in 1994. The Everman/Major Fund was established by an anonymous gift in 2005 to memorialize these two writers who passed away in 2004. 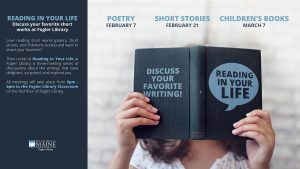 Love reading short works (poetry, short stories, and children’s books) and want to share your favorites? Then come to Reading in Your Life at Fogler Library, a three-meeting series of discussions about the writings that have delighted, surprised, and inspired you. Come ready to discuss the writing you love–and if you’d like some inspiration, check out the display cart by the first-floor elevators! Participants are welcome to attend any individual sessions they’re interested in. Sessions are held at 5pm in the Library Classroom of Fogler Library. 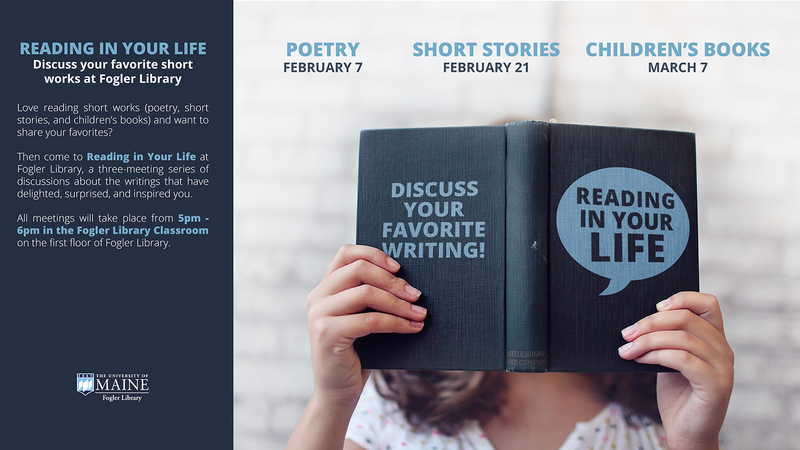 The topics and dates are as follows: Poetry (February 7), Short Stories (February 21), Children’s Books (March 7). A poster is attached. This Week in English 16 circulated to faculty and friends of the department on Monday, February 5, 2018. If you would rather not receive these weekly bulletins, please reply with <unsubscribe> in your subject line.